My friend, Jessica Z., made this picture above. I love it! I had never seen this verse before this week and it spoke VOLUMES to me! I am reading the book Stressed-Less Living by Tracie Miles with Proverbs 31 Ministries Online Bible Studies. I am a Facebook small group leader for the study and I am being so blessed by this study! This week when I read this verse, it hit me as to how many times we chose worry and reason over quietness and trust? I found it interesting that God says it is in quietness and trust that we find strength and yet according to the Lord (and it is true) people would rather worry and fret than stay in quiet trust. "but, you would have none of it". Why is that? Why do we choose to worry rather than to rest? My hope is that after today, we will choose the rest, quiet and trust instead of refusing what the Lord is offering. Why would we have none of the peace the Lord is offering? Why turn down a good thing for something bad? He is offering us a big juicy steak, fries, and chocolate cake (with no calories attached!) and we are settling for stale bread and bitter brussell sprouts. Another translation of Isaiah 30:15 says, "In returning and rest is your salvation." The word "returning" is the Hebrew word "shuwbah" and it means "retirement or withdrawal". Doesn't that sound nice? Retirement. *Sigh* Awww..... The word "retirement" infers rest, relaxation, and peace. Let's retire our worry! The word "salvation" in the Hebrew is "yasha" and you are going to LOVE what it means....VICTORIOUS! So, when we retire our worry and rest, we are victorious, liberated and delivered!!! "In quietness and trust is your strength, but you would have none of it." "Quietness" is translated from the Hebrew word, "shaqat" and means "to be quiet, be tranquil, be at peace, rest, lie still, be inactive." "Trust" means, well, "trust (and confidence)." Quiet. When we are facing a difficult situation or circumstances, can we quiet our minds, be still and just trust? Can we listen to the Lord when He says, "Be still and KNOW I am God." (Ps 46:10)? Will we rest and find victory? Will we be quiet, still, and trust? It is in the quiet and trust we find strength. Or will we have none of it? As for me, I would like an extra super size large order of rest, quiet and trust with a huge helping of VICTORY on the side! Give me some of that! Father, help us to be still and KNOW YOU are God. We surrender our cares over to you, Lord. We give them to You. We choose to rest in You and find victory. We choose to be still and trust You to be our strength. We love you, In Jesus' Name, Amen. Anxiety is all around us in this world. Many Christians struggle with anxiety and live with guilt because they know God says not to worry. God does say not to worry, but you may be wondering how? How do I not worry with everything going on all around me? How do I not worry in this world of chaos and unpredictability? The answer: Our mind. Anxiety is rooted in our thoughts. Our thoughts determine our attitude. The enemy will come to try to put negative thoughts into our minds, but he cannot force us to accept those thoughts. When a thought comes, we need to assess the thought and not just accept every thought. Assess before you accept! Does the thought line up with what God says? If you don't know what God says, then go to His Word and see what he has to say about it. If it is a negative thought, I about guarantee it isn't from God. After assessing the thought and deciding that it doesn't line up with God's Word, we then need to disregard the thought and cast it out. We need to take those thoughts that don't line up with God's Word and cast them down. Sometimes this is easier said than done. It may take many times, days, even weeks to change our thoughts. It will happen though if we persist in our quest to rid our minds of destructive thoughts. 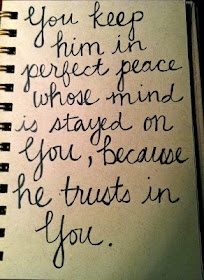 The verse at the top of the page says, "You will keep him in perfect peace whose mind is stayed on you." Peace may seem like a foreign far off fairy tale to you. However, God is always faithful to keep His Word. The key is our mind. Again, if your mind is always thinking about the negative "What ifs", then it isn't stayed on Jesus. If you are someone who struggles with worry and anxiety, please stop feeling guilty. Guilt and condemnation are never from the Lord. God doesn't say we have to keep our minds in perfect peace. He said, "I will keep him in perfect peace." It is our job to keep our minds on Him. It is His job to keep us in perfect peace. We don't have the power in and of ourselves to keep ourselves in perfect peace, only He has that power. He is faithful who promised. God is not a man that He can lie (Numbers 23:19). He will see that His Word is performed. Keep your mind on Jesus today. He will give you a perfect supernatural peace that can only be found in Him. Love you! Father, I pray that we would keep our minds on You. I pray that we would cast down every thought and pretense that sets itself against the knowledge of You and take captive every thought and make it obedient to Christ. Father, thank you that you keep us in perfect peace when we keep our mind on You. We love you and trust you in all things. Protect our homes, our country and our families. We trust you. In Jesus' Name, Amen. As a mom, the words "Do not!" come out of my mouth often. Do not forget to put down the toliet seat! Do not leave your clothes on the floor! Do not eat the dog food! Do not pick your nose! We moms know we mean business when the words "Do not" come out of our mouths. This analogy is what I thought of when I read the verse above. God is our heavenly Father and just like we earthly parents tell our kids "Do not" for their own good, He tells us "Do not" for our benefit. But, do we listen? 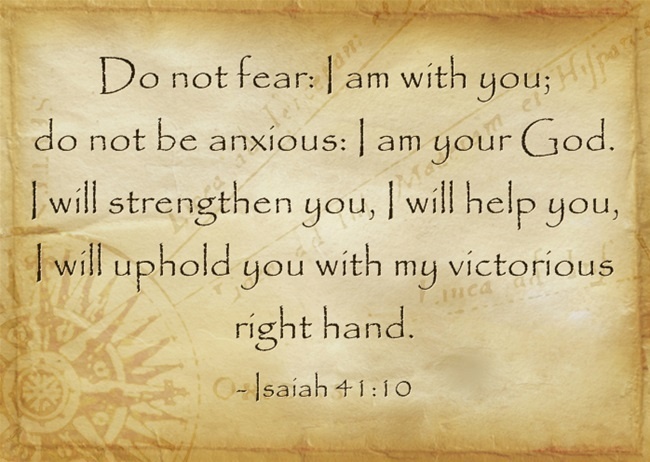 "Do not fear; I am with you;"
The great "I AM" is with us. 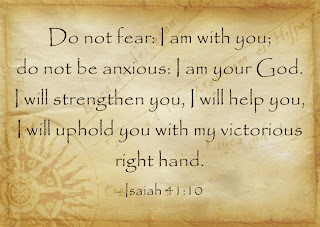 We don't have to fear because He has promised to never leave us nor forsake us. His presence is always with us. I remember a time when my daughter, Sarah, was attempting something new and she was afraid she would fall. I told her "Don't be afraid. You can do this, and I am right here to catch you." She continued to go across. She kept her eyes on me, she knew I was right there with her and she made it across. We need to keep our eyes on Jesus to make it across. What we keep our eyes on determines our reaction. I looked up the word "anxious" in the Hebrew in the next part of this verse and I found it very interesting. "Do not be anxious: I am your God." The word "anxious" here is translated in other translations "discouraged" or "dismayed". These words come from the Hebrew word "sha'ah" and it means "to look away, cause gaze to turn away". He is telling us, "Do not look away from me. Do not turn away and look all around you. LOOK AT ME dear child. I am your God and I love you so very much." When we are anxious, discouraged, or dismayed, it is because our gaze has turned away from our heavenly Father. We have looked away from Him and set our eyes on our circumstances, problems, or fears. "I will strengthen you and help you." He is our God. When we keep our eyes on Him, we can remain steadfast, secure, and courageous. We can be full of faith that our Father will safely help us to the other side. "I will hold you up with My victorious right hand." We don't have to be afraid of the path ahead. In fact, God says, "Do not fear". God will lead us steady and strong and He will hold us up. We can move forward in faith knowing that we will not fall. We are victorious in Him. We will make it to the other side. Just keep your eyes on Jesus and do not fear. Do not fear. Just trust. It was a Sunday. The sunlight beaming between the blinds shed light on the darkness of my reality. Where was I? I did the thing I told myself I would never do again...again. No more. That morning I "came to [my]self". I knew I couldn't continue to live in the pit. I was perishing of hunger. Only it wasn't the hunger of a physical kind. I was perishing spiritually and heading down the path to complete destruction. I reached bottom that day. I arose and went searching for my Father, my heavenly Father. The year was 1995 and I was a Junior in college. It was the beginning of finals week at the University of Illinois. I ran that morning from church to church searching for someone who could help me. I ran and I ran. Church to church to church. Nothing. No one. Church had already let out. No one was there. Was there no one who could help me? Crying in desparation, I asked God, "God, please help me." I ran to the farthest church I knew of on campus. It was close to my Freshman dorm. I had visited it once while a Freshman. That seemed ages ago. I found someone who would listen to me. They called a senior girl from their college group and asked her if she could talk to me. It was finals week and I know she needed to study, but I am forever grateful that she took some time out of her studying to talk to me. I wish I knew her name. She listened, she advised, and she prayed with me. I knew I could not keep living in the same self-destructive way I had been living. I felt so unworthy of love of any kind--God's love or man's love. She spoke words of truth and grace. She doesn't know it, but she saved this soul from death by her words of grace. I hope God will arrange for us to meet in heaven so I can give this girl who gave up a Sunday of studying during finals week to help free a girl from the depths of hell a proper thank you. She helped lead me back to the cross, back to grace, back to Christ, and back to my Father. Tears are streaming down my face as I read the verse above. Not only was I running toward God that day...God ran toward me. He was there with me all along. He never left me and never gave up on me. When I came to Him, He hugged my neck, kissed me and rejoiced that His daughter had returned. I felt so unworthy to be called His child, but He said, "Bring the best robe...put a ring on [her] hand and sandals on [her] feet." He took my old dirty rags full of sin and replaced them with "garments of salvation" and "a robe of righteousness" (Isaiah 61:10). Not only did he cover me with a robe of righteousness, he has since given me the fatted calf as well. God has restored my life and has done above and beyond all I could ever ask or think. His blessings overwhelm me. I know the pit I was in and I weep at the thought of our Father's never-ending love and grace. Oh Lord, that you would love me even in my sin and rescue me from my pit of destruction!!! My heart rejoices and I am forever grateful! Are you in a pit today? Are you hungry and thirsty spiritually? Arise! Run to Him! You will find Him. He has already found you. Although you may feel unworthy, God says you are worthy. He has a robe, a ring, sandals, and a fatted calf waiting for you. With anticipation oozing from every inch of me, we packed our suitcases and headed south for Spring Break to the Sunshine State-Florida! Our family had never taken a "beach" vacation. Normally we head straight to Mickeyville and dose ourselves with 7 days of Disney Magic. 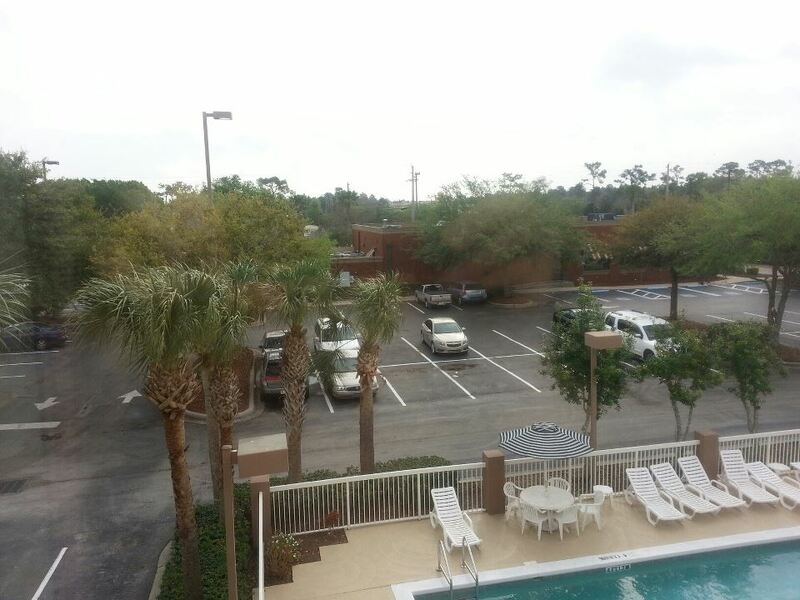 However, this time we purchased a marketing package that included 3 nights in a "two bedroom condo on the beach" and 4 nights in Orlando. It was a great deal and it was in writing that we would be in a "condo on the beach". The Sunshine State was not so sunny when we arrived--apparently an omen of what was coming. We arrived at the resort bouncing with excitement. 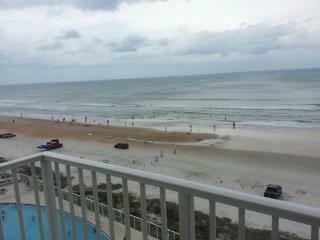 The skies were clearing now and we were eager to check in, get swimsuits on and head down to the beach! We went to the check-in counter. The lady behind the counter asked for our name. A frown developed on her face as she informed us that the resort was full and they did not have a room for us. They had overbooked it. Immediately, I knew what was going on. This was a test. God, what are you up to? Oh Lord, help me pass this. You know how much I LOVE the beach. We were disappointed, but tried to maintain a positive mindset. After all, mistakes happen, right? The lady behind the counter told us she contacted her manager and he had arranged two adjoining hotel rooms at the Sleep Inn for us down the road by the interstate (our family doesn't fit into one hotel room). In case you don't know, I am a self-confessed hotel snob. Yes, sadly it is true. I like to stay at nice places. Don't misuderstand, Sleep Inn is a fine hotel, it just isn't where I would normally choose to stay. Also, I am of the opinion that when going to the beach, it is best to stay on the beach. Does anything compare to the waking up to the sound of waves crashing against the shore and the sea gulls calling in the morning air? Or opening up the glass sliding picturesque doors and walking into a masterpiece of God's creation while feeling a soft ocean breeze? This was suppose to be our view. Awww...breathtaking! On the bright side, the cars zooming past on the interstate nearly simulated the sound of ocean waves and we did have a pool view with palm trees. That is at least something. The Sleep Inn also does have a lovely continental breakfast in the morning complete with a waffle maker (that sometimes works). At first I did fairly well with the trial. I maintained a positive attitude while focusing on the lovely free continental breakfast. I looked for what we could be thankful for in this situation. We had enjoyed a wonderful day at the beach. The weather, which had looked ominous at one point, cleared up. God blessed us with warm sunshine to enjoy the waves and sandy beaches. That night, after tucking in our tuckered out kiddos, I headed down to the treadmill at the Sleep Inn. As I went down steps, the smoky aroma of the hallway reminded me of my whereabouts and my heart began to sink. Again, I began to ask, "Why God? Why is this happening? We were suppose to be at a beautiful resort on the beach?" As my feet pounded the treadmill, frustration mounted and disappointment escalated. I cried out to God. "Why are we here? This isn't right. How could this happen? We haven't been to the beach as a family in five years and we haven't ever had a beach vacation. What is going on here?" "Contentment is not a destination, it is a decision." I laughed because I knew He was right. Was I only going to be content if I was at my desired destination-- the resort on the beach? Or was I going to be content at the Sleep Inn by the interstate? It was my decision. I repented and decided "Yes, I will be content at the Sleep Inn." It turned out after some further investigation that the people we were dealing with at the resort and the marketing package lied to us. So, here is another test. How are we going to react to this mistreatment? God did not cause the bad people to lie to us, but He did divinely intervene to use this as a trial to see how we would respond. He knew this would happen. It did not surprise Him. Nothing surprises Him. Are we really suppose to count it all JOY when we fall into various trials? It isn't that we are to be glad about the trials, but rather rejoice about the development of our character that will come as a result of the trial. Without trials, there is no growth. As hard as it was for me to swallow, it was more important for God to continue to develop me and mold me so that I may one day be complete and lacking nothing than for me to have a beach view. As far as the test goes, I am not 100 percent sure I passed. I was quite angry at the bad people who lied to us and let one of the salespersons know it. I was firm, but I don't think I was disrespectful to her in any way. Like I said, I am not sure.